Exceptional home in secluded Woods at Josephinum! Worthington Schools! Highly sought after 1/3 acre lot with spectacular views of York GC! 1st floor features an executive den with gorgeous wood work and built-ins, home theatre, full bath, inviting living room w/ gas log fireplace focal point, formal dining room, and laundry/mud room! Remarkable kitchen w/ SS appliances and beautiful cabinetry–kitchen updates include granite counters, custom kitchen bar, flooring, backsplash, lighting, sink. Previous screened in patio/deck has been transformed into finished entertaining area w/ lots of windows, insulated walls, and skylights! 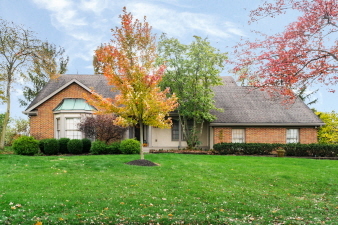 Stunning finished basement w/ bar and cabinetry and newly added half bath. New furnace/ac 2016! Many new windows 2013-2015! Invisible dog fence! Hot water tank 2012!